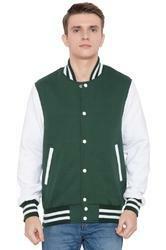 We have an exclusive collection of varsity jackets which are manufactured in variety of colour combinations. These garments are designed with premium grade quality raw material according to the market trend and are very comfortable. We are prominent & Leading Supplier and Manufacturer from Greater Noida. we offer Trendy Varsity Jackets such as White Varsity Jacket, Trendy Varsity Jacket, Green Stylish Varsity Jacket, Red Trendy Varsity Jacket, Blue & White Varsity Jacket, Red & White Varsity Jacket and many more items. chest "P" CHENILLE PATCH, CHENILLE PATCH. 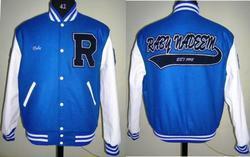 We provide a wide range of Blue-White Varsity Jacket that is available at market leading prices. Manufactured using superior quality raw materials, these jackets assure long lasting results and, hence, they are appreciated by our customer’s world wide. Owing to their eye-catching colors, alluring designs and stylish patterns, they are perfect to wear at any occasion. 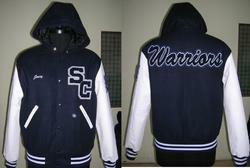 We are engaged in manufacturing and supplying an extensive range of Varsity Jackets & Chenille Patches. 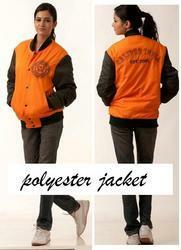 Our entire range of these jackets includes different colour combinations and a plethora of designs. We offer these at industry leading prices to our customers. Packaging Details: each jacket packed individually. 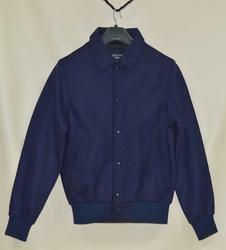 We offer Standard Navy Varsity Jacket in different shades. Fabricated from the finest quality fabrics that ensure the standard quality and long life of the garment, these garments are durable enough to stand any tough conditions. We provide customization facility to address client's specific needs. Our customers can purchase these from us at competitive prices. 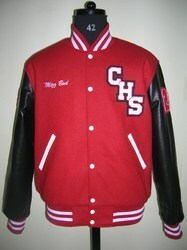 We are leading manufacturers and suppliers of Letterman Jacket in variety of color combinations as per the requirement of the buyers. We also customize chenille patches according to demand of the buyers. We provide this range at most reasonable rates.